If you are looking for a housewarming present for a fashion savvy friend, or simply want to update your home and are looking for inspiration, we have searched for the biggest trends for 2017 and made a guide to help you keep up with the interior design in 2017. Brass is metallic and shiny but has a vintage charm and there is a definite nostalgia in this year’s interior designer trends. That is why brass is pushing its way into mainstream, replacing last year’s copper accents. Flooring made of terracotta is becoming popular again, so spruce up old floors and present them with pride. The earthy texture and warm tones of terracotta play very well into the general trend of bringing natural organic materials into the house. Many 60s and 70s staples are making a comeback this year and cork is one of them. Its appeal is in the fact that it is a versatile, eco friendly material. So if you are looking for a housewarming gift, cork homeware might be a good way to go. 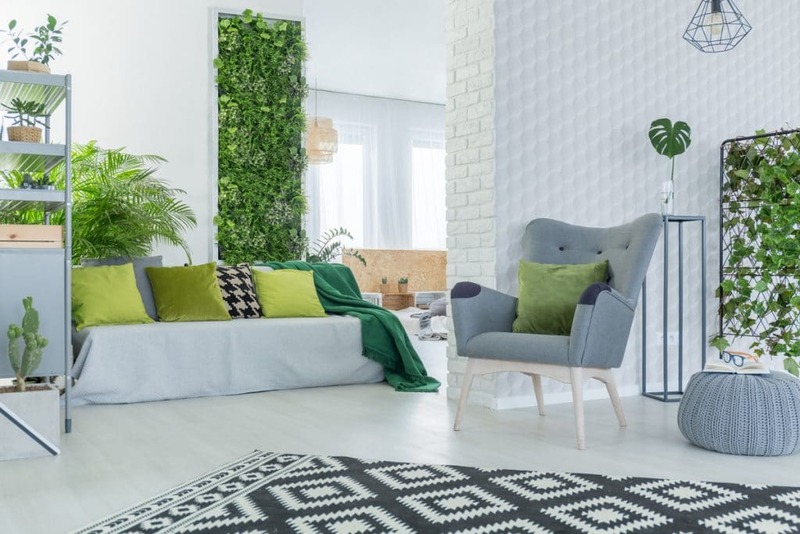 Deep greens are a definite trend for this year’s interiors in the search for calming, soothing spaces that recharge us and tend to our well being. Whether you bring that green in your home by growing a terrarium, going for tropical leaf prints or simply through paint and soft furnishings, you cannot go wrong with green in 2017. You might think neon colours belong in the 80s or kids bedrooms, but there are grown up, designer approved ways to incorporate them in eye catching interiors. Small popping neons within neutral colour schemes are very trendy this year. Another muted, soothing colour to be seen in interior design in 2017 is a blue denim. A cool shade called Denim Drift has been named Colour of the Year by Dulux and we can definitely see the universal appeal. Pick the shade for an accent wall and mix it with cool whites for a minimalistic look. The hexagon rage started last year and it goes on well into 2017. As a 3D terrarium or lamp shade, or as a printed pattern, hexagons are here to stay for a while, so if you are looking for a geometric print with a very modern edge, this might be the way to go. A coffee table that seamlessly and fluidly transforms into a dining table for 6? You could have it in 2017. With the returned focus on craftsmanship and design pieces, you are most likely to find exquisite and surprising designs out there that fully accomplish their function while still pleasing to the eye.